Ripped straight from King Kong, creatures known as "terror birds" stalked South America millions of years ago, brandishing impressively huge beaks. New research into how they used this appendage shows just how appropriate their name really is. Andalgalornis steulleti wasn't a particularly large member of the family Phorusrhacidae — better known as terror birds — coming in at a mere 4.5 feet tall and 90 lbs –– but what it did have was an enormous skull, more than 14 inches in length, with a viciously curved beak. Scientists wanted to know how this six million year old bird, and the rest of its family, used their enormous death-dealing beaks. Without any surviving relatives, they turned to CT scans and the world of computational biomechanics to find out. Researchers from all over the world worked together to piece together just how scary an attack from this flightless bird would have been. Imagine facing off against a fencer, but instead of a foil, they're armed with a pickaxe. They rapidly move back and forth, testing your defenses, waiting for an opening. Then they bring down the weapon, smashing your skull, ripping it open to feast on the gooey bits. That's more or less the way they think the carnivorous Andalgalornis steulleti would have hunted, by using an "attack-and-retreat" strategy, and biting straight down with their incredible beaks, and then pulling back. How did the researchers come to this conclusion? 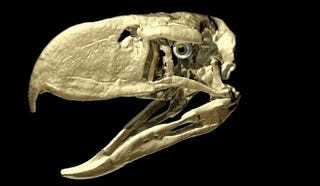 They took a fossilized skull of A. steulleti, and put it through a CT scanner to better understand the structure, finding that unlike most birds, which have lots of mobility between the bones of their skulls, the fossilized skull was extremely rigid. Combining this information with data on the bite pressure of living animals, they found that the A. steulleti couldn't bite very hard for its size, and was pretty incompetent at side to side motions of the head — but it excelled at stabbing. "Relative to the other birds considered in the study, the terror bird was well-adapted to drive the beak in and pull back with that wickedly recurved tip of the beak," said Stephen Wroe, director of the Computational Biomechanics Research Group at the University of New South Wales. Keep in mind that A. steulleti was only 4.5 feet tall, some of its relatives, like the Kelenken genus, are believed to grow to 10 feet tall, and weigh 500 pounds. I think calling them "terror bird" is completely accurate, don't you? Read the scientific paper in PLoS One.